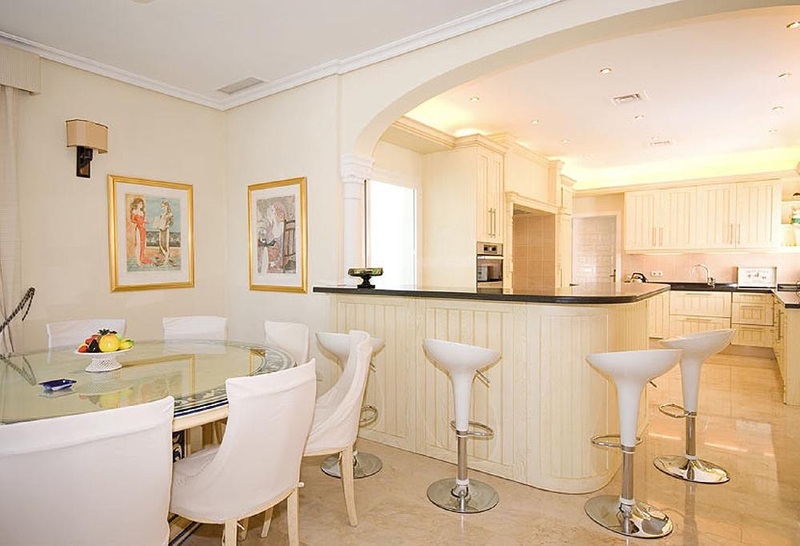 Azure Holidays are delighted to offer this luxury 5 bedroom villa in the beautiful and charming Nueva Andalucia area. 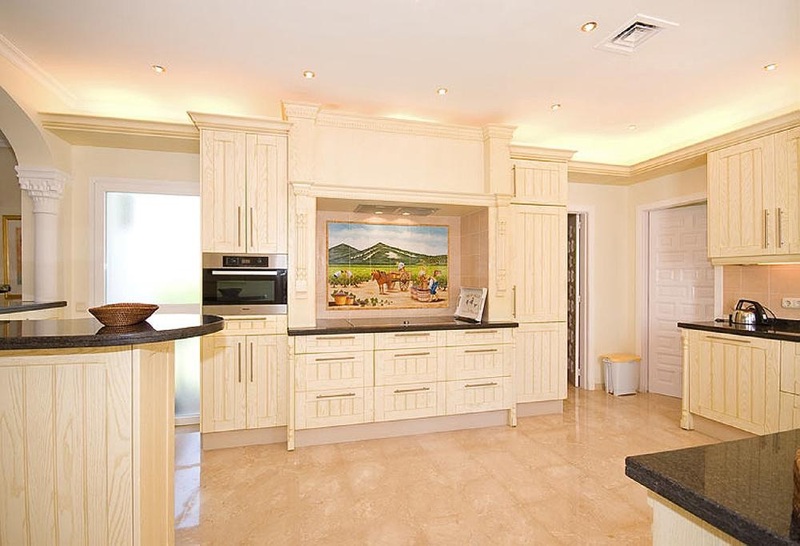 Within walking distance of both beach and shops – if you can bear to tear yourself away from the gorgeous private heated pool – this luxury villa is superbly fitted out to the highest of standards. Ask Azure "We love the way this villa combines the high glamour of old-style Hollywood with a comfortable and gracious atmosphere; whether holidaying with family or friends, there is a glorious feeling of spaciousness with the added bonus of lovely large communal areas so everyone can gather in comfort. The quirky green roofs make the whole villa seem to snuggle beautifully into the surrounding greenery; this villa may be ideal for the international espionage agent who wants to remain unseen by Google Maps! But whether taking time out from saving the world or just enjoying what the world has to offer, we can promise that this amazing villa will leave you not shaken but definitely stirred." Nestled amongst its own private lawned gardens, beautifully tended bushes and trees give the villa and it's outside spaces both seclusion and a restful touch of nature. 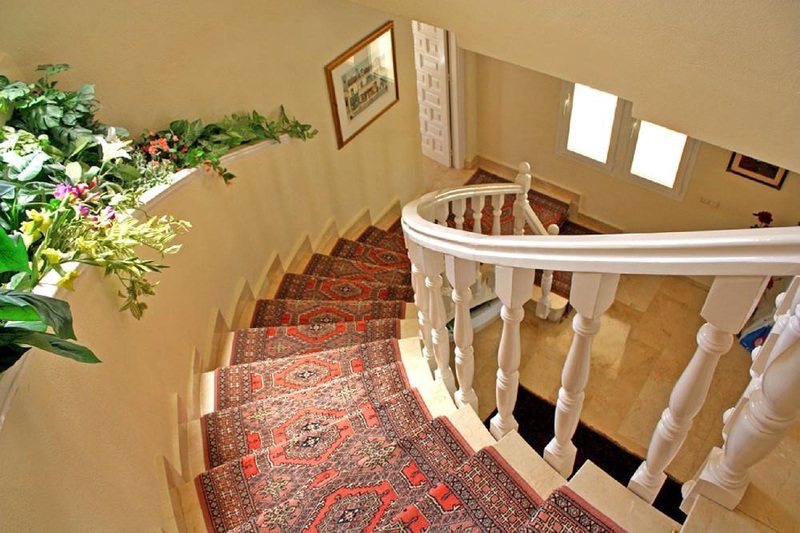 The adventure starts from the moment you enter through the wrought iron gates that give added privacy and security. 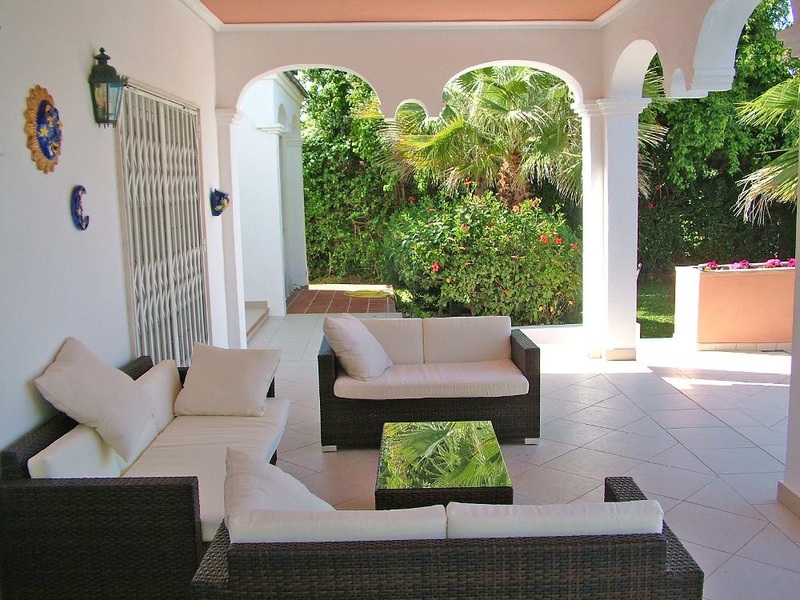 Double gates swing open to allow you to drive your hire car - should you have one - straight onto a paved area fronting a roomy double garage, whilst a separate pedestrian gate gives onto a pathway with steps leading right up to the villa front. 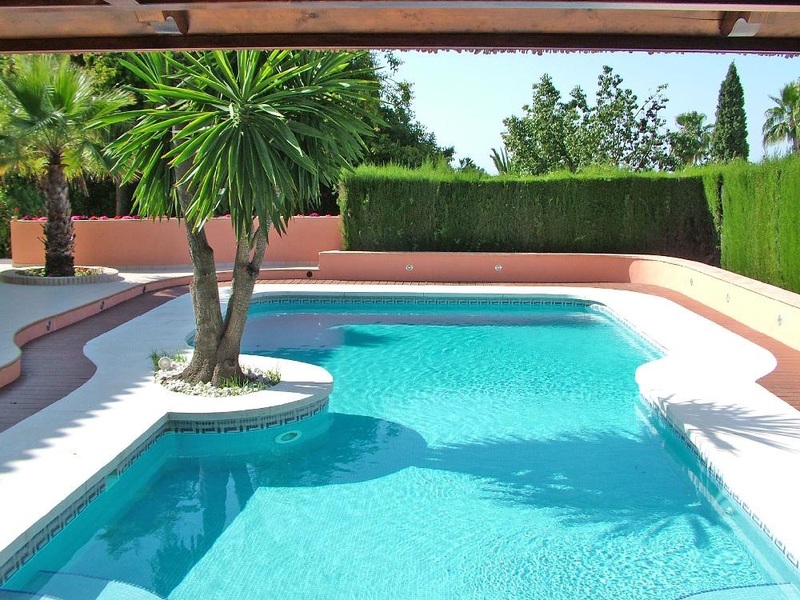 The jewel of the front garden is without doubt the fabulous private pool, tree-shaded and with stepped areas at one end for easy access, or for just sitting and soaking up the sun. Alongside this end is a rustic covered dining area with large table for those delightful al fresco meals. With plenty of room for sun loungers dotted poolside, lazy days and evenings are sorted before you even need to open the front door. 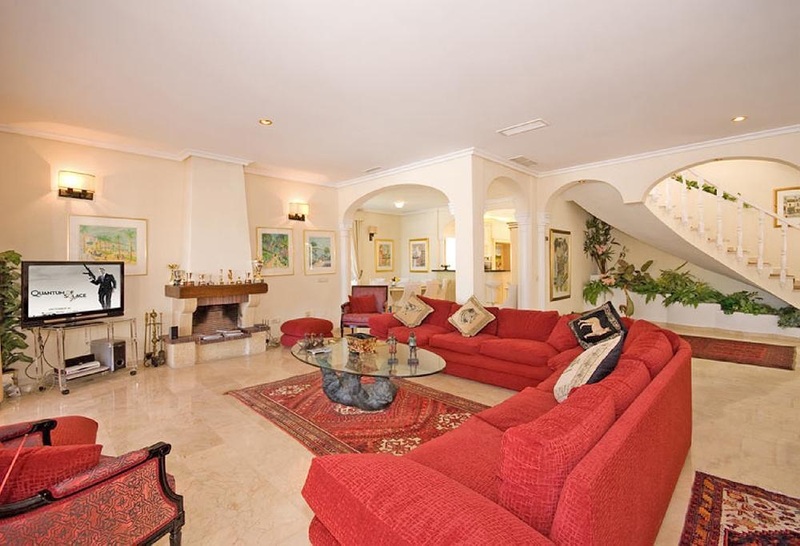 Running along the front of the villa is the main covered terrace supported by stylish white archways. Decorated in crisp white with a soft terracotta ceiling, furnished with elegant dark wood couches and chairs covered in large soft comfortable cushions, there is a rococo touch of the exotic which will make evenings under the stars that bit more special. The outside living doesn't stop here, though. There are three more secluded balconies and terracotta-paved upper patios, with glorious views of the azure sea, a feast for the eyes and senses alike. Inside, the wonderful layout continues the theme of sophistication fused with comfort. 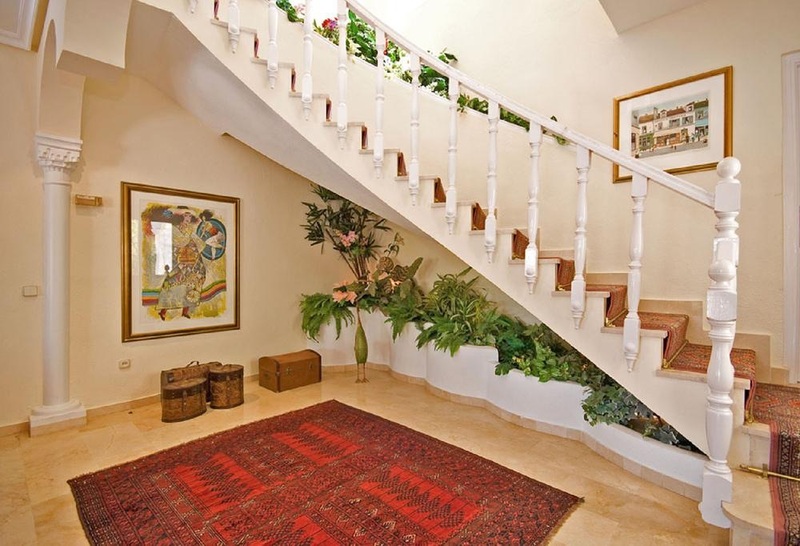 A sweeping stylish staircase leads out from the living areas. 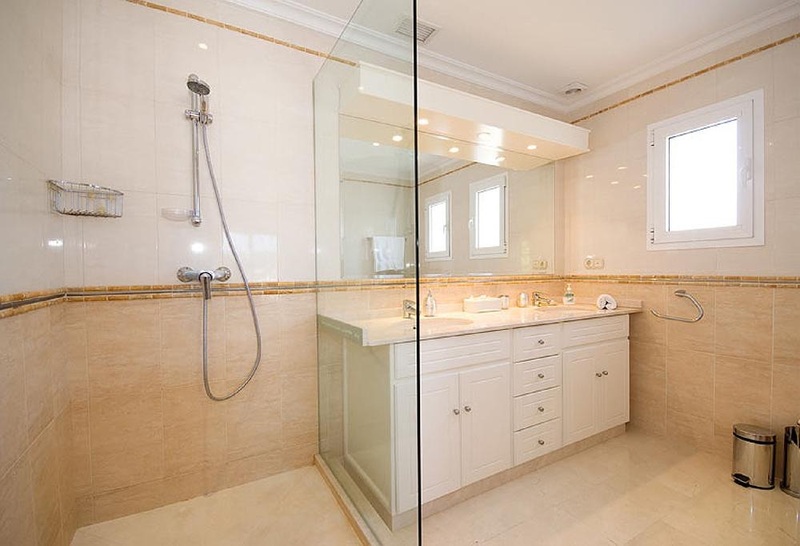 Light bright walls maximize the golden sunlight, and soft neutral floor tiles echo the rich and classy atmosphere. 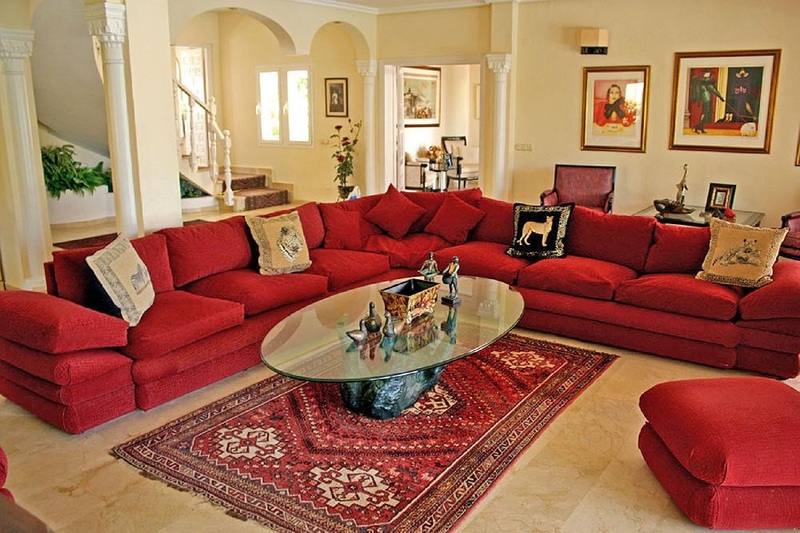 Huge curved couches in welcoming soft red colourways seem to ask you to sink into their cushioned seats and relax whilst watching the large flat screen TV. Air conditioning keeps you comfortable and fresh with a lovely even interior temperature. Moving through to the dining area, the large elegant glass-topped table will comfortably seat your entire party, and flowing seamlessly along from here is a breakfast bar with retro white bar stools, so you can sit and nibble tapas or simply chat to whoever is rustling up a delicious meal in the superbly appointed kitchen. 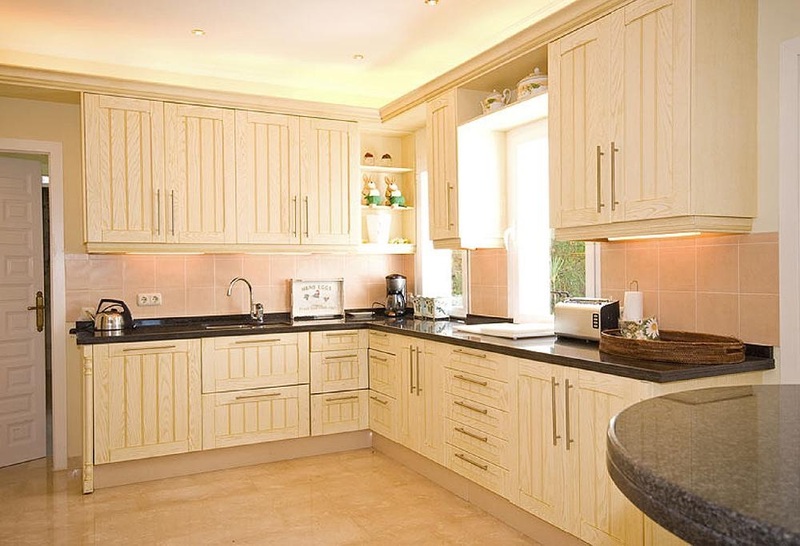 Packed full of modern appliances yet with an antique whitewood feel and charming tiled countryside scene, the kitchen is a delight to use and will have the whole family queuing up to take turns in being chef for the night. Plus, with a dishwasher fitted in there will be no need to worry about having to do the washing up afterwards. Additional storage and utility rooms lead off from the kitchen, complete with washing machine to rinse the sea and sand out of bathing costumes, and tumble dryer to whisk them dry afterwards. There is a choice of 5 bedrooms each with a style to suit everyone, from a double-bed master suite with wall-to-ceiling sliding glass patio doors leading out onto the balcony which gives stunning panorama of the area and sea view, to crisp stylish twin-bed and beautifully appointed double rooms. 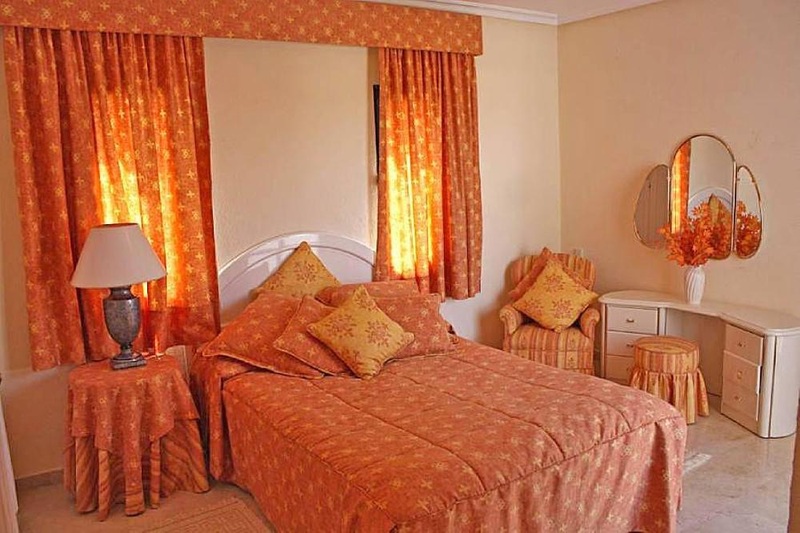 Each bedroom has its own designer décor scheme, the rich earthen tones of the fabrics giving a feel for restful nights. 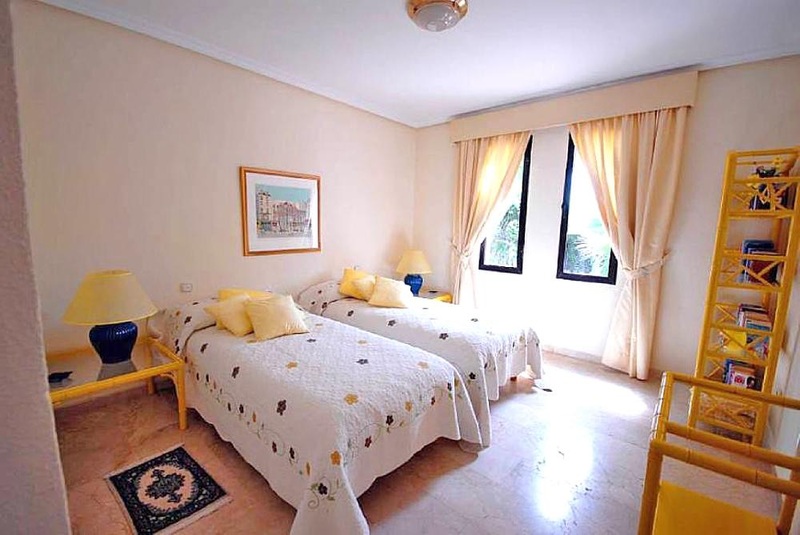 All rooms maximize natural light, and give a variety of views whether of the seafront or the gentle greenery of the gardens. With five superbly appointed bathrooms there will be plenty of time to enjoy refreshing showers and pampering as you ready yourself for a day at the beach, or browsing the local shops, or trying your hand at a round of golf. This stunning villa will offer you the very highest standard of accommodation, with warmth and sophistication a feature of every room. 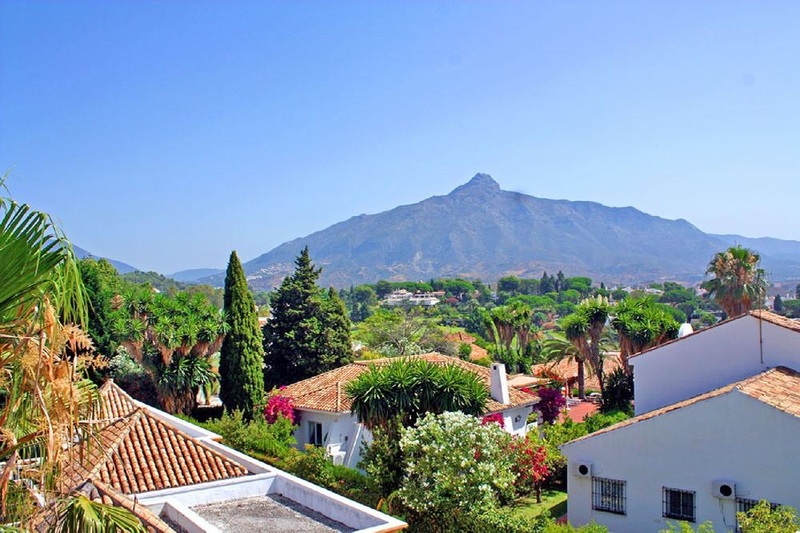 The undulating nature of the Nueva Andalucia eventually entices everyone under its spell. 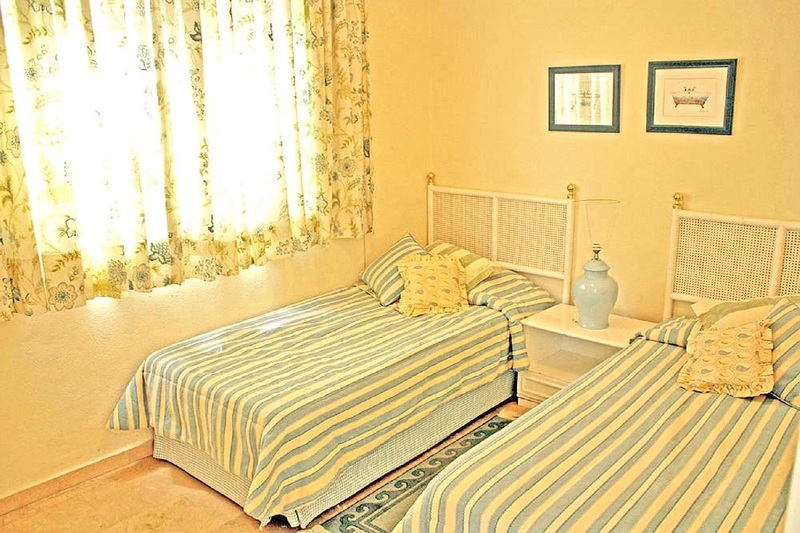 Designed with relaxation and enjoyment in mind, this peaceful area of the Costa del Sol has much to offer. 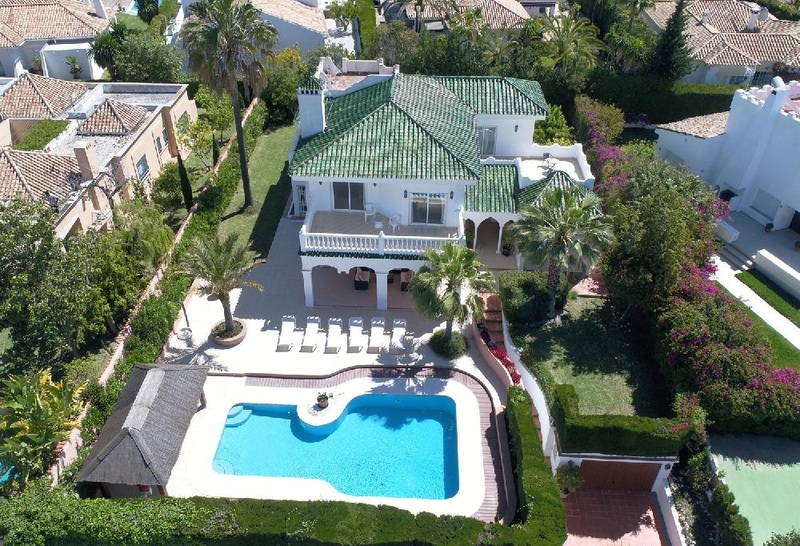 Less flashy than the headline grabbing Marbella and Puerto Banus, this elegant neighbour offers luxury on a grand scale. 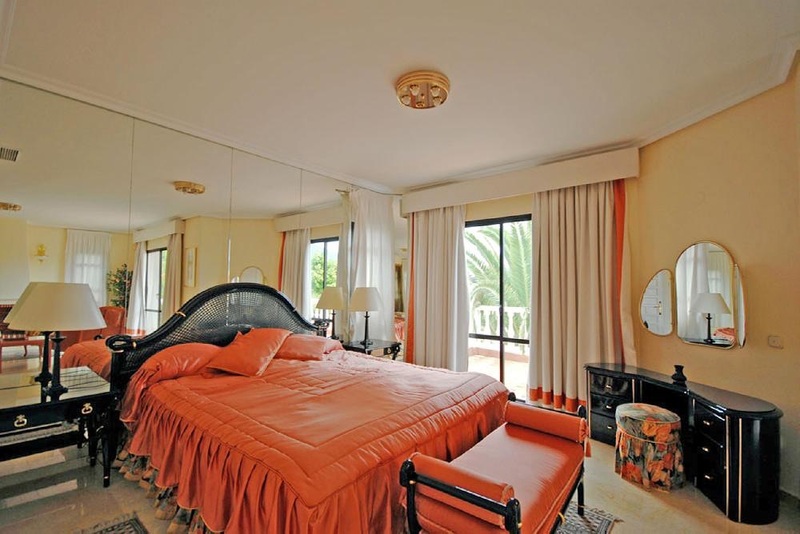 This villa is in a wonderful golf location, as it is set right in the heart of two of the best golf courses in the Costa del Sol, the Aloha Golf Club and Golf Las Brisas. 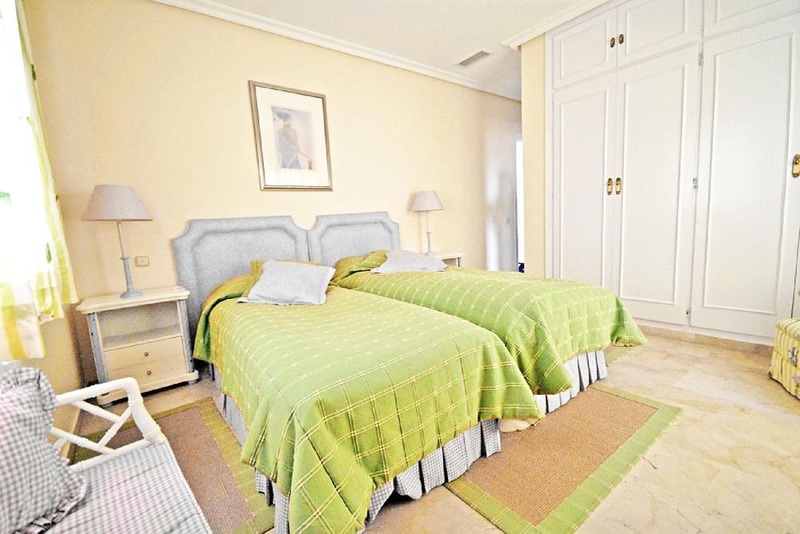 As if those two were not enough, you are only a very short distance to La Quinta Golf and Los Naranjos as well - talk about golfer's paradise. 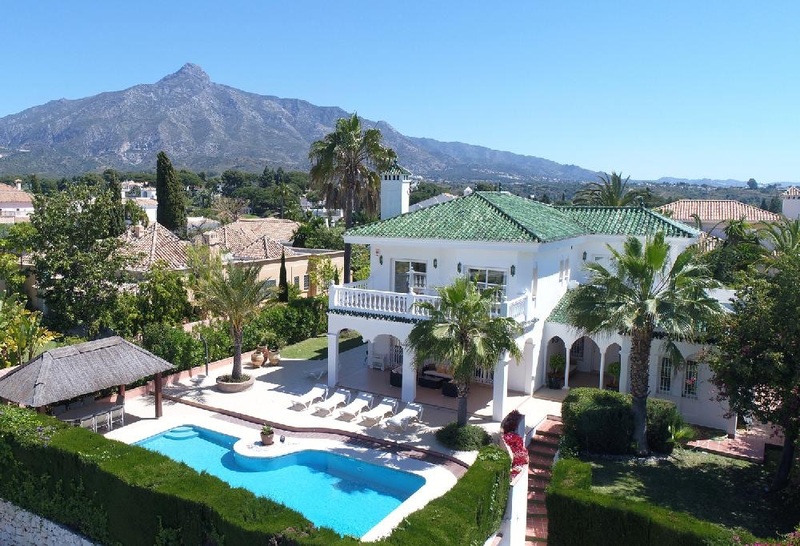 Of course you have all the other delights of the Costa del Sol at hand, from nearby Marbella shopping and nightlife, to people watching at Puerto Banus, not forgetting some of the best beaches in the world! 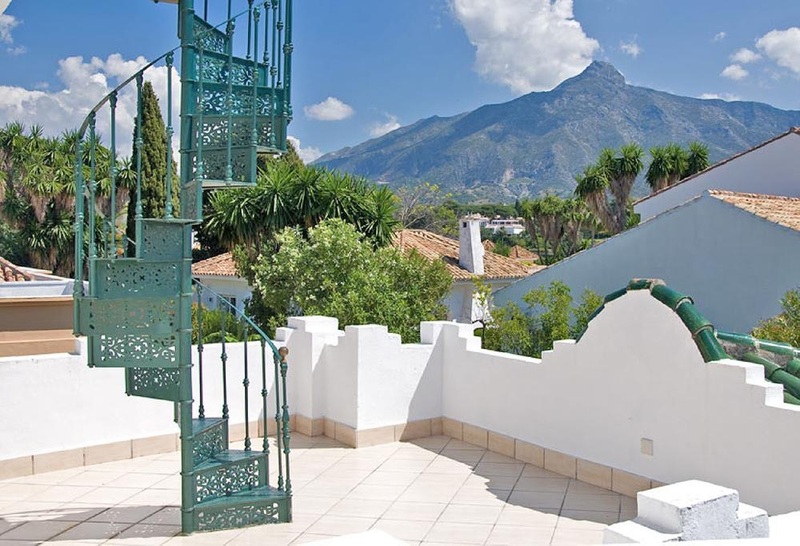 If you would like to read more about this amazing area of the Costa del Sol then please read our guide here. Our team of experts are very knowledgeable about all of our properties and locations, so please get in touch with any questions you might have.